As management teams and Boards of Directors are faced with growing headlines citing increasing regulatory pressures, breaches, compliance deficiencies and fines, the risk management team is under pressure to solve a very complex problem. In this webcast, Marshall Toburen, RSA Archer GRC Strategist, will discuss how organizations can harmonize enterprise risks from disparate silos across the organization. By bringing these metrics together, the organization can leverage consistent risk identification, assessment, prioritization, decision support, treatment and ongoing monitoring. The information in this webcast will help you move from the existing, complex system risks that lack consistent assessments and decision making as well as effective accountability structures, and move your risk management program to an era of simplicity. 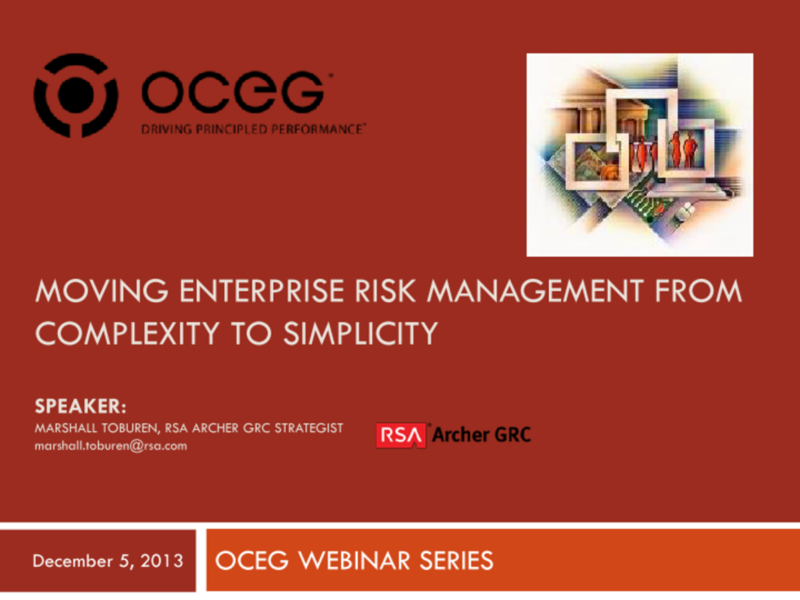 We have emailed instructions to access Moving Enterprise Risk Management from Complexity to Simplicity Slide Deck to . Make sure the email arrives in your inbox: either add "support@oceg.org" as a safe sender to your email platform, or if you use Gmail, drag our email into your Primary tab.